Both blood oranges and common oranges are nutrient-rich citrus fruits that make them suitable additions to a well-rounded and healthful diet. Common oranges include recognizable citrus varieties like Valencia, California and navel oranges, but the more distinctive blood orange possesses a richer red or maroon color and raspberry-like flavor and scent. Despite their color and flavor difference, the two varieties of oranges share comparable nutritional statistics. Both blood orange and common oranges have a caloric range from 60 to 90 calories, largely derived from natural fruit sugars in the citrus. Common oranges, however, present a larger range of sizes than blood oranges. Pinhas Spiegel-Roy, author of "The Biology of Citrus," notes that common oranges can be as large as five inches in diameter and weigh as much as 190 g, but average closer to 3 inches, or 140 g. Blood oranges tend to be slightly smaller than the largest common oranges, rarely weighing more than 160 g. Due to their smaller size, blood oranges tend to have slightly fewer calories than common oranges, but similarly sized oranges have nearly identical caloric contents. Common and blood oranges of rich sources of vitamins and nutrients. A common and blood orange of similar size each provide more than 100 percent of your daily recommended value of Vitamin C, which ranges from 60 mg for women to 75 mg for men, according to the National Academy of Science's Food and Nutrition Board. Blood oranges and common oranges each provide approximately 80 mg of vitamin C. Each type of orange also offers about 5 percent of your daily need for vitamin B-6, or about 0.25 mg.
One of the only nutrient distinctions between blood and common oranges is in the amount of antioxidants, nutrients that neutralize the free radicals associated with a range of health conditions. 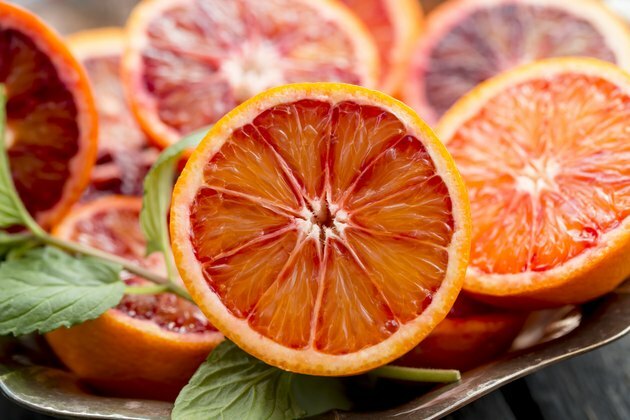 The distinctive red pigment in blood oranges is the result of elevated levels of anthocyanins, natural antioxidants found in smaller quantities in common oranges. The higher levels of anthocyanins translate into a higher dosage of the antioxidant, which is linked to reducing cholesterol and lowering the risk of heart disease, according to a 2005 study in the journal of "Molecular Science and Food Research." However, subsequent studies have suggested that though anthocyanins have antioxidant properties prior to consumption, many of their effects are destroyed through digestion. Comparably sized common and blood oranges provide between 4 and 7 g of dietary fiber, a nutrient critical to healthy digestion. Folate, or vitamin B-9, is also present in both common and blood oranges, averaging between 40 and 50 mcg per medium-sized fruit. Common and blood oranges are both fat-free foods, and neither is a significant source of cholesterol or sodium.